When I visited France last summer, my family from the Mayenne region made sure to put the Robert Tatin Museum, near Cossé-le-Vivien, on the itinerary, and it became the highlight of my visit. Although it is located around three hours outside of Paris, it’s worth the trip. Robert Tatin, who died in 1983 at the age of 81, was an eccentric environmental artist who sculpted his home and the surrounding fields into an unique museum. While the tour inside Tatin's cottage, with its rounded concrete walls and mosaics, is interesting, it's the connecting courtyard that's truly worth the visit. To the left of the cottage entrance is the towering, 13-foot-high Dragon (pictured above). 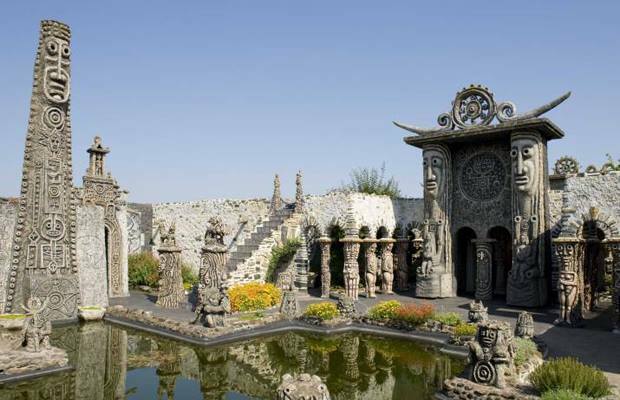 From there you can enter the meditation garden, an enclosed space with concrete statues covering every wall and column, and surrounding a man-made pond. It took Tatin 21 years to complete this area as part of his search for a "universal language" and you will see influences from both the East and West, as well as references to the sun, moon, stars, and passing of time. The effect is a cross between Easter Island, a Zen garden, and a Dr. Seuss book. Rooms branch off from the courtyard featuring exhibitions of his paintings. If you don't understand French, book an English-language tour in advance. The museum is open February – December and costs 7.20 euros (about $10) for a full-priced ticket, which includes a guided tour, or 20 euros ($27) for a family ticket, which covers two adults and at least two children. Plan to spend about two hours exploring the grounds. Which unique museums around the world would you recommend? Let us know in the comments.